Floating pontoons are becoming widely used structures to support large-scale civil projects, entertainment activities, and even temporary access to permanent installations. 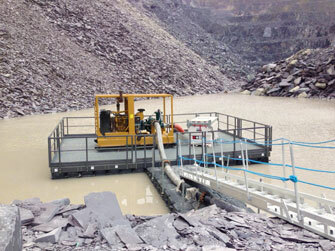 Recently, a quarry operator needed a floating pump platform for dewatering, a necessary process resulting from excavations which occur below natural groundwater levels. Dewatering allows excavations to occur in workably dry and stable conditions. Through the removal of water, mining and extraction crews gain improvements in transportation, digging conditions, and blasting conditions. The reduction of moisture within stone or ore products also lessens the production of waste by-products. In this application, Pipex px® fabricated and supplied a 20' by 30' fiber reinforced polymer quarry pump platform. Weight and rigidity were key issues in this design since the end user requested an ample area to mount pump equipment, personnel, and support equipment. In floating applications, steel’s strength to weight ratio creates deflection and buoyancy issues. The weight, stability, and corrosion resistance of FRP provided designers with an opportunity to improve on traditional metallic quarry pump pontoons. The end-user in this instance specified its own buoyancy limits. A lightweight structure allowed for more equipment weight on the platform to yield better capacity gains. 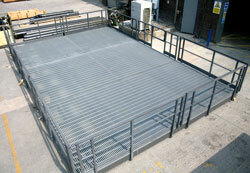 To create a floor for the structure, DURAGRID® I-6000 was chosen. EXTREN® profiles were used within the support structure and were prefabricated in 10' x 20' sections. SAFRAIL™ Industrial Railing system was prefabricated, flat packed, and attached on-site to streamline installation at the quarry. Upon completion, both the contractor and quarry users were pleased with the design, installation, and operational functions of the pontoon. Click here to view the case study in its entirety.